Haryana is a landlocked state in northern India. It is located between 27°39' to 30°35' N latitude and between 74°28' and 77°36' E longitude. The altitude of Haryana varies between 700 to 3600 ft (200 metres to 1200 metres) above sea level. An area of 1,553 km2 is covered by forest. Haryana has four main geographical features. The river Yamuna flows along its eastern boundary. The ancient Sarasvati River is said to have flowed from Yamuna Nagar, but it has now disappeared. The river Ghaggar is Haryana's main seasonal river. The Ghaggar rises in the outerHimalayas, between the Yamuna and the Sutlej and enters Haryana near Pinjore,Panchkula district. Passing through Ambala and Hissar, it reaches Bikaner inRajasthan and runs a course of 460 km (290 mi) before disappearing into the deserts of Rajasthan. Important tributary are Chautang and Tangri. The Markanda River is also a seasonal stream. Its ancient name was Aruna. It originates from the lower Sivalik Hills and enters Haryana west of Ambala. During monsoons, this stream swells into a raging torrent notorious for its devastating power. The surplus water is carried on to the Sanisa lake where the Markanda joins the Saraswati and later Ghaggar. Shahbad Markanda town is situated on its bank. The Sahibi River, also called Vedic Drishadwati as mentioned in Shatapatha Brahmana originates in the Distt. Jaipur in Rajasthan at present times. However before seismic activities some 7500 years ago in Aravalli Hills, the river brought water even from Ajmer district. Gathering volume from about a hundred tributaries in Rajasthan and Mewat areas, it reaches voluminous proportions, forming a broad stream around Alwar and Patan. Further flowing via Rewari District and Dharuhera, reaching Jhajjar it branches off into two smaller streams, finally reaching the outskirts of Delhi and flowing into Najafgarh lake that flows into the Yamuna through the Najafgarh drain. However, of late, hardly any water flows in Sahibi as most of the water is impounded in small check dams uptream in Alwar district of Rajasthan and the Masani barrage in Rewari district, built on this river on NH 8 (Delhi-Jaipur highway) remains dry. There are three other rivulets in and around the Mewat hills – Indori, Dohan and Kasavati and they all flow from East to West and once were tributories of Drishadwati/Saraswati rivers. The climate of Haryana is similar to other states of India lying in the northern plains. It is extremely hot in summer, around 45 °C (113 °F) and mild in winters. The hottest months are May and June and the coldest being December and January. Rainfall is varied, with the Shivalik region being the wettest and the Aravali Hills region being the driest. About 80% of the rainfall occurs in the monsoon season (July–September) and sometimes causes local flooding. Thorny, dry, deciduous forest and thorny shrubs can be found all over the state. During the monsoon, a carpet of grass covers the hills. Mulberry, eucalyptus, pine, kikar,shisham and babul are some of the trees found here. 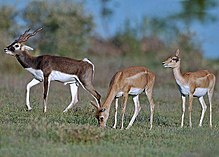 The species of fauna found in the state of Haryana include black buck, nilgai, panther, fox, mongoose, jackal and wild dog. More than 300 species of birds are found here. The Haryana has 2 National Parks, 8 Wildlife Sanctuaries, 2 Wildlife Conservation Areas, 4 Animal & Bird Breeding Centers, 1 Deer park and 3 Zoos, all of which are managed by the Haryana Forest Department of the Government of Haryana. Haryana has a rich cultural heritage that goes back to the Indus Valley Civilization era. Dhosi Hill, the ashram of revered Rishi Chyawyan is an important site where Chyawanprash was formulated for the first time. The last Hindu emperor of India who belonged to Rewari in Haryana, Samrat Hem Chandra Vikramaditya, also called Hemu, taking a cue from Vedic times declared himself a 'Vikramaditya' king after defeating Akbar's forces in Delhi in 1556. It amounted to establishing a vedic 'Hindu Raj' in North India during medieval period after a gap of more than 350 years. The age-old customs of meditation,Yoga and chanting of Vedic mantras are still observed by the masses. Famous yoga guru Swami Ramdev is fromMahendragarh in Haryana. Seasonal and religious festivals glorify the culture of this region. Haryana has a variety of folk dances. The people of Haryana have preserved their old religious and social traditions. The 21st century pop-culture in Indian media has portrayed Haryanvi culture as masculine, arrogant and the language as rude/heavy. However, the land and language has its own mellifluous aspect in the folk culture, songs and dance-dramas . Nowadays Haryanavi is spoken in Bollywood movies because of the impression. The culture of Haryana and the humour is very much similar to that of Punjab (as Haryana was a part of Punjab state). They celebrate festivals with great enthusiasm and traditional fervor. Their culture and popular art are saangs, dramas, ballads and songs in which they take great delight. Regarding eating habits, there is an idiom that says, Hara-Bhara Haryana, Jit Doodh-Dahi ka Khana (meaning a lush-green state where milk and curd are the food). Food and cuisines of Haryana are almost same as the ones in Punjab (Greater Punjab); popular Haryanavi dishes include makke di roti (grounded dry corn) and sarso da saag, lassi (sweet yogurt), rajma, cholay-bhature, etc. The headquarters of DLF Limited, India's largest real estate company, in Gurgaon, Haryana. The economy of Haryana relies on manufacturing, business process outsourcing, agriculture and retail. Gurgaon is called as City of the Millennium. It is called Shanghai. It has been developed in last 2 decades. Gurgaon is one of the most expensive area to live in. It is a hub of call centers. It is a land of opportunities as it is the center of business. Faridabad is a biggest industrial city of Haryana as well as North India.It is home to hundreds of large-scale companies like Orient Paper & Industries, JCB India Limited, Nirigemes, Agri Machinery Group (Escorts Limited), India Yamaha Motor Pvt. Ltd., Whirlpool, ABB Group,Goodyear Tyres and Knorr Bremse India Pvt. Ltd.
Yamuna Nagar is the largest industrial town wholly within Haryana. It has Asia's largest paper mill, BILT, and Asia's largest sugar mill.Yamuna Nagar has Asia's largest timber industry, an HPGCL thermal power plant, a hydro power plant and India's largest railway workshop.It is also famous for its old steel and brass industries. Bahadurgarh is an important developing industrial town with glass, steel, tiles manufacturing and biscuits production. Panipat is a city of textiles and carpets. It is the biggest centre for cheap blankets and carpets in Indiaand has a handloom weaving industry. The pickle "Pachranga International" is well known. Panipat has heavy industry, including a refinery operated by the Indian Oil Corporation and a National Thermal Power Corporation power plant. Hissar is another developing city and home town of Navin Jindal and Subhash Chandra of Zee TV fame. Savitri Jindal, Navin Jindal's mother, has been listed by Forbes as a 3rd richest woman in world. Ambala is the largest manufacturer of scientific apparatuses. It is named 'Science City' of Haryana. Ambala is one of the biggest exporters of education instruments in the country. Kurukshetra (Ladwa) has the second largest grain market in the Asian continent.